We are supporting our friends over at Manila Surfers Association! The 7th Manila Surfers’ Cup: Para Sa’yo To Kid! 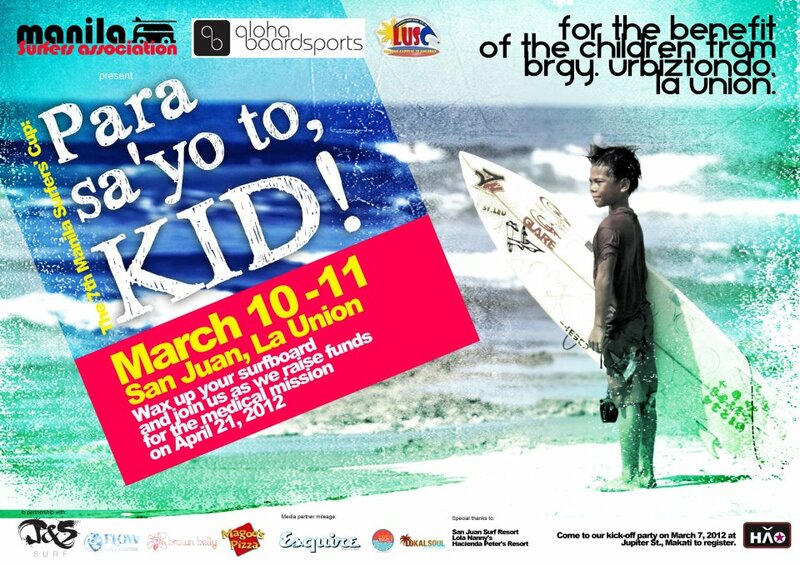 is happening this weekend, March 10-11, 2012 at San Juan, La Union. Not only are we getting stoked Manila style this weekend, the competition will be raising funds for the medical mission (for the benefit of the children of barangay Urbiztondo, La Union) on April 21, 2012. Who’s gonna be the rookie of year from the Novice division? Who’s gonna outlast them all and be crowned champ at the Open’s division? And who’s gonna… cement his/her place in MSA history at the Invitationals? Lastly, who’s the craziest surfer with the most outrageous outfit at the Costume competition? To know more about this awesome competition, check out MSA on facebook or better yet, pop over at the kickoff party at HAO HK Diner at Jupiter St, Makati on March 7, 8pm! See you all this weekend, let’s get stoked!